It is a very solid contribution to the developing world of art jewelry. (Capitalist types look well, the making of new markets and profit opportunities for you is buried in this, and other related books). After personally recently bemoaning the lack of alternative points of view (The New Jewelry Review in JCK) this book offers an American rebuttal to that book, an enlargement upon it in American terms (Darned if I’m still not listed in one of these!). An excellent foreword by Barbara Rose makes an argument that fame is a strong driving force which divides the ‘major’ from the ‘minor’ and the ‘fine’ from the ‘applied’ arts, as she puts it: ‘Jewelry remains craft’. She notes that the essays in this book ‘go a long way in opening the door to a redefinition of contemporary jewelry as art’. This is followed by a short piece by Jack Lenor Larsen which ends by complimenting Susan Lewin on her work in this volume. The acknowledgments provide a unique insight into the supportive and rapidly developing world of art jewelry connoisseurs and makers. The introduction offers a number of convincing assertions regarding definitions for art jewelry and commercial jewelry, in essence demanding and proving that art and jewelry can be one and the same, even using the viewpoints of art critics to make points. Lewin then moves into a discussion of the differences between European Art Jewelry, again from an American viewpoint. This book provides a solid skeleton around which to begin to discuss American art jewelry in a broad, inclusive (even academic) manner. A concise (and somewhat focussed) history of American art jewelry by Toni Greenbaum follows, then an essay by Suzanne Ramljak. It is nice to see successful commercial art jewellers like Robert Lee Morris included at last in an academically oriented book. It is interesting and perhaps a little odd how some Jewellers (Resnikoff for example) are defined in terms of the techniques they used. This section is followed by a portfolio of jewelry artists, a glossary, a bibliography and index. The book is high quality (nice creamy paper) with 255 illustrations, 208 of which are in color. 224 pages long it has excellent photographs, printed well, but not quite the best printing I have seen. The jewelry artists section has wonderful, insightful descriptions of each artist and their viewpoints derived from interviews, letters, statements and personal correspondence between the author and the artists. One has to pick someone but there are hundreds of other great artists out there so I guess we still need a few more books in a similar vein to complete the picture of the contemporary art jewelry scene. Great photos, wonderful work, interesting ideas (yes-they are Arty), great images. The book concentrates on the middle generation of American Art Jewellers and to some extent some of the new generation, which is kind of nice (Woe betide anyone who missed the former group though, you’ll have to check out Turner and Dormer’s book and old Metalsmith magazines for a glancing view of them). This is already second and third generation work since the 70’s, maybe more. Things are moving along and the people picked for this book demonstrate that. Susan Lewin did a good job of this. A recommended pick for anyone who likes this kind of thing. Note that this type of work implies the future, or parts of it. If the art jewelry world follows the contemporary ceramics or glass world you are looking at the beginnings of a real set of investment opportunities for commercial jewellers to foster, accept and benefit from such a scene, as the Germans did. In the 60’s and 70’s the German commercial jewelry industry (and their government) decided to foster and heavily support German art jewelers by sponsoring exhibitions, publishing them in trade magazines and so on. Looking at a current German trade magazine today with ads for contemporary commercial work (yes it really does sell and yes it really is in everyday jewelry stores) one would be hard pressed to find much American commercial work to equal it in style or looks. The commercial interests in Germany decided to construct a new market for themselves utilizing the artists and the leading edge of design in the field and after pumping money in for a while managed to do so expanding sales even further for themselves (otherwise they wouldn’t be advertising in those magazines you know). Americans can learn a lot from this. Build the market for art jewelry and then go make money on it. Support the artists and the echoes will support you. 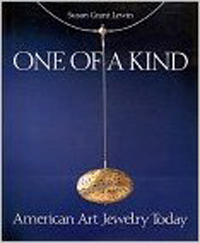 With this book and others coming soon the documentation required to construct an investment market of American Art Jewelry is just about there.